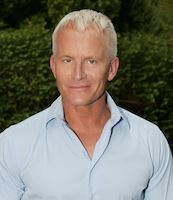 Born in Oslo, Norway, Geir Ness is the very picture of health with his vibrant skin, fit body and endless natural energy. He attributes his vitality to a healthy diet, balanced lifestyle and an early training in natural herbal remedies abundant in his homeland. Several years ago, this student-turned-entrepreneur launched Norway’s first designer women’s fragrance, Laila, inspired by scents from his native Norway. He followed afterwards with a successful men’s fragrance then a body care line. Marketed in Nordstrom stores, Disney Resorts, Theme Parks and Cruise Ships in the US, as well as around the world, the line incorporates native herbs and flowers like those harvested from the hillsides near his home. He followed with Skin of Norway, where Geir harnessed the power of locally-sourced antioxidants, hydrators, mineral energizers and cell-repairing agents to protect and help make skin resistant to premature aging, even in hostile Nordic environments. Despite Geir’s grueling travel schedule of 300 personal appearances and media interviews a year, he still exercises and cares for his own skin. He’ll share his philosophy about optimum skin performance and reveal the ingredient secrets behind the creation of his unique, natural skincare products and fragrances and why they appeal to a wider global audience. Members - $45.00 (USD)- Up to 2 guests may be registered at the time of member registration. After which a $15 LATE REGISTRATION FEE will apply. SPECIAL NOTE: New Policy - ALL RESERVATIONS must be PAID at the time of Registration. Beef Bourguignon with Green Beans, Purple Potatoes topped with roasted sliced Almonds. Filet of Sand Dab with Lemon Butter & Capers with Rice Pilaf, Asparagus & Hearts of Artichoke. Vegetarian – Risotto with Mushrooms, Asparagus & Fennel on a bed of Sauteed Spinach.